A couple weeks after being released on the North American Switch eShop, Japanese developer Poisoft has shared three videos for its game Vroom in the Sky. The videos showcase the gameplay of the title, with CEO Hiroshi Ishikawa narrating the experience. 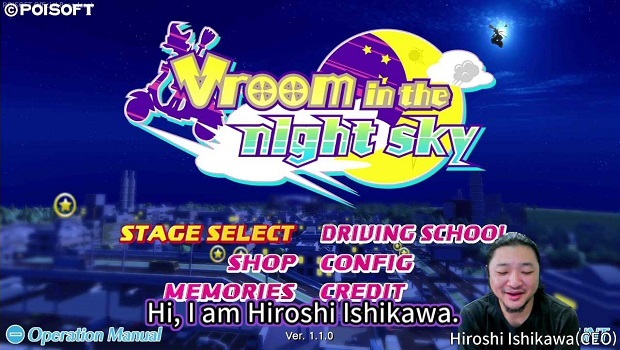 While originally a launch title for the Switch eShop in Japan and Europe, Vroom in the Night Sky was delayed until April 5 in North America. The game revolves around flying through different stages as a magical girl to collect keystars in order to complete the level. The videos highlight different mechanics as well as a driving school mode, which was patched in for the original release in March. Below is the tutorial and driving school video, while the other two videos delve into speed run and trick play mechanics, respectively. Vroom in the Night Sky is available now on the Nintendo Switch eShop for $9.99. Stay tuned for more news on Gaming Trend.